There’s something about the early 20th century that just feels ripe with adventure. The time of Indiana Jones, mysterious relics, naughty Nazis, curious curses, and jovial, flamboyant accents. Ah yes, the 1930s, what a glorious time indeed. 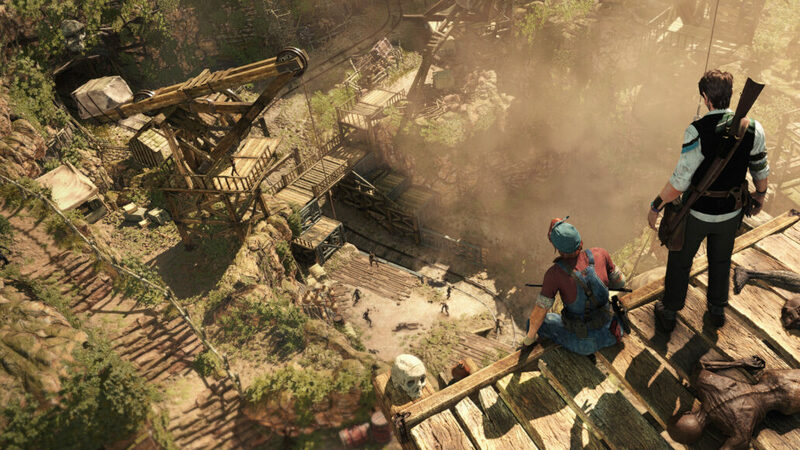 Nothing quite captures this camp camaraderie like Strange Brigade, the new multiplayer shooter from Rebellion, developer of the acclaimed Sniper Elite series. So what is Strange Brigade? The short story is that it’s a team based multiplayer shooter that’ll pit a team of four friends up against hordes of the undead as they move through a unique stage, solve puzzles, and of course, shoot lots of enemies. Now now, don’t fear. That last paragraph might’ve given you visions of Left 4 Dead, but this is more than just a clone of other ideas and is instead very much its own experience. 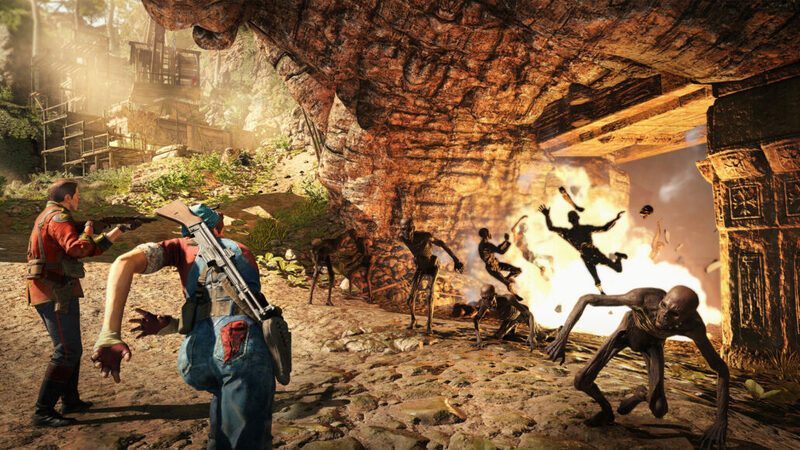 While Left 4 Dead wants players to frantically survive against undead enemies, survival isn’t so much of a concern in Strange Brigade. I mean, yes, you want to survive, but a good player – and a good team – can make it through stage relatively unscathed, it’s the journey that’s more important here. Most multiplayer focused games throw the story into the background. Post-apocalyptic world, an alien invasion, the rise of the undead, it’s usually one of those premises and then just a standard multiplayer horde experience, the kind we’ve become used to since the Call of Duty series first hit success with the Zombies mode. But in Strange Brigade, the setting and the stages you move through are so much more important. 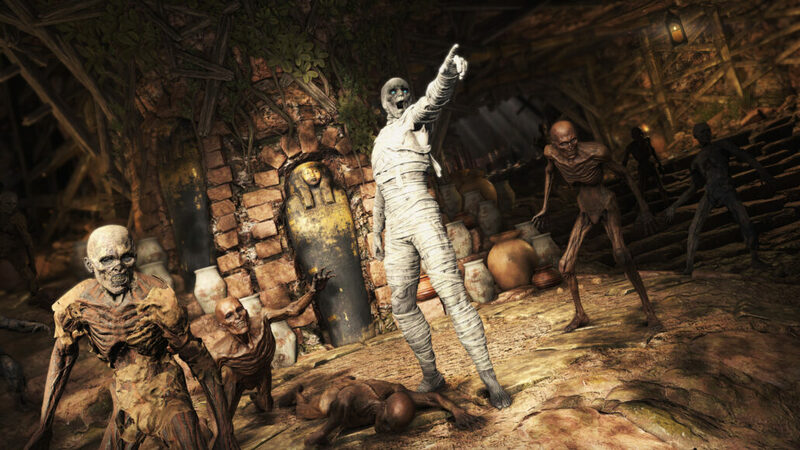 Set in 1930s Egypt, you’ll be plundering tombs, delving into dungeons and shooting off a vast variety of weaponry, all with a jovial narrator making wee comments as you go. A lot of the personality and humour the game has – and believe me, there’s plenty to go around – comes from this narrator. His accent is strong and distinctly English, with almost a Monty Python level of self-awareness. It’s lots of fun and made me smile plenty of times, but can also begin to wear thin. But it’s a good thing the narrator is here, because the distinct personality the game has is incredibly important, and without it, well, there’s less to love. You move through fairly linear stages, that have a good number of hidden collectibles and items to find for those willing to rummage around and spend time solving extra puzzles, and of course, shooting a lot of enemies. Most rooms will often lock you down until you destroy the enemies within, and you might find progress locked off every now and then until you manage to take down a final, shambling foe, hiding somewhere in the stage. Other than the smaller, slow-moving fodder, there are tougher, faster enemies. Shielded enemies, enemies with spears, enemies that teleport, enemies that blow fire that can make it hard to see, in addition to the damage you receive. These mid-tier enemies come up fairly frequently, and there’s a good variety. A group of these will make you want to pull out explosives or the big guns, while smaller enemies don’t feel so threatening. It’s a good thing there are guns. Your character has a basic pistol and automatic weapon to use, but they’re fairly weak, and the results come in when you manage to find gun chests. For a few coins, you can open them up and get a more powerful weapon, which will shred through enemies. These even make mincemeat of the boss enemies, and it’s always worth having one saved – or even running for the chest mid-battle. The gunplay is fine. It’s hard to love it, as much of the time will be spent with your basic weapon set, which is deliberately bad, even with gun upgrades. But then as soon as you can use the expanded weapons, explosive crossbows, electric shotguns, powerful snipers and automatic rifles… Yep, then it starts getting very, very enjoyable. If only you could spend more time with them. Having poor base weapons is certainly a good way to make purchasing temporary weapons incredibly worthwhile, that’s for certain. When you’re not shooting down enemies, what will you be doing? Shooting other stuff, I guess. Many items in the environment can be used to change the environment. Explosive barrels are obvious, but blowing open passages with cannons and shooting stalagmites from ceilings is less so. Mind, objects that react when shot will glow red when you aim near them, making it more obvious. You’ll even be shooting points to open up pathways and solve puzzles. Shoot symbols, shoot switches, shoot symbols in a certain order… Yeah, there will be shooting alright. And then we get to the conclusion. It’s a multiplayer game. 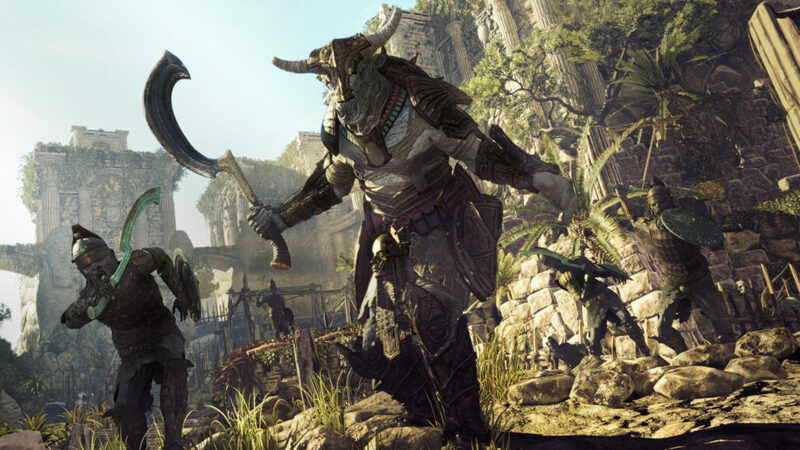 Strange Brigade is a game built with you and three of your friends in mind, playing together online, smashing through the campaign, and even coming back for scores, challenges and the horde mode. It’s not a game meant to played solo, and the difference in the experience between the two is vast. Solo, everything in the game can quickly start to feel, well, tedious. With friends? Not at all. I’d question why there’s no local multiplayer, then, but I think we all know why. I’ll have it known, though, that I will always respect a game willing to incorporate local multiplayer, regardless of the less-than-ideal results we’ll surely see from the resolution and framerate in return. On the subject of framerate and performance, on PS4 Pro, I have zero complaints. Strange Brigade comes locked at 30FPS by default, but there’s an unlocked option, and while it isn’t a completely smooth 60FPS, it is pretty damn close, and for my money, makes the game more enjoyable to play. Though, it does also audibly spin up the fans on my console. Reviewed on PlayStation 4 Pro (code provided by the publisher). You can purchase the game for PlayStation 4 or Xbox One via Amazon, for PC via Green Man Gaming. Should you buy Strange Brigade? If you have some friends looking to invest some time in this game playing with you (and some money too, since they’ll have to buy their own copies) then yes, absolutely. With pals, this is a great ride. Looking to go solo? Um, it’s a bit more of a hard sell. You can jump in with people online of course, but it’s not the same as your friends being along for the ride.